Hepatitis C virus (HCV) infection is a major public health concern leading to end-stage liver disease, hepatocellular carcinoma, and cirrhosis. HCV which has been classified into six genotypes causes hepatitis C. It is a blood-borne virus presenting with single-stranded positive sense RNA. With no effective vaccine for HCV so far; the threat of chronic liver disease continues to exist. In the developed countries, HCV infection is the foremost cause leading to the requirement of liver transplantation. Higher degrees of geographic variability and distribution have been observed. Higher prevalence rates are found in African and Asian countries and lower prevalence is observed in industrialized nations in Northern and Western Europe, Australia, and North America. China has been reported to have seroprevalence of 3.2%. In Pakistan, seropositivity rates were found ranging between 2.4% and 6.5%. Egypt with an estimated population of 73 million has been reported to have highest seroprevalence rate of 22%. In India, an overall rate of 0.9% was reported in one community-based study. Transmission of HCV is primarily through the parenteral route and source of infection include injection, needle stick accidents, blood transfusion, and intravenous drug abuse. The present survey shows that some regions have even higher prevalence of hepatitis, especially the Malwa region which has been found most affected but remained neglected due to the lack of any hepatitis control policy that can outreach these areas. HCV viral infections are associated with the poor socioeconomic condition of the exposed population along with the increased age, active sexual life, and exposure to various risk factors including lack of awareness, illiteracy, unsafe blood/blood product transfusion, organ transplantation, chronic renal disease requiring hemodialysis, occupational exposure among health-care workers, therapeutic injections, dental treatment, barber shops sharing razors, unscientific practicing by quacks, surgeries performed by qualified medical professionals under inadequate sterilization practices, vertical transmission, poor sanitation, tattooing with unsterilized equipment, and unprotected sexual contact.,, The barriers in the preventive and control measures of this viral infection include lack of awareness in general population about the routes of transmission and insufficient execution of vital preventive measures. The patient population of Malwa region of Punjab has been found less privileged on health-care facilities and budget allocation. To the above concerns, the present study was planned and conducted to find out the magnitude of risk factors and common causes of HCV in Malwa region of Punjab. Mukh Mantri Punjab Hepatitis C Relief Fund has been created to treat all hepatitis C patients along with preventive measures to eliminate HCV infection from Punjab to benefit these patients and to save thousands of lives in the state. The fund is provided by Finance Department, Punjab and utilized for procurement of the drugs for the free treatment of the hepatitis C cases in the Punjab state. Regimen-4: Tablet Sofosbuvir (400 mg/day) + tablet daclatasvir (60 mg/day) for patients with compensated cirrhosis for genotype 1, 3, and 4. Prevalidated questionnaire was designed to collect their demographic information including age, gender, demographic area, occupation, and clinical information including history of dental treatment (extraction, root canal treatment, scaling), blood donation, blood transfusion, surgical intervention, drug abuse (oral or intravenous), and tattooing. Thus, demographic, geographical, and clinical information of these HCV-positive patients coming for free medicine was obtained. The study was conducted for a period of 6 months (November 2016 to May 2017). A total number of 778 HCV-positive patients were enrolled. Grossly incomplete information was received from 38 patients so they were excluded from the study. Remaining 740 subjects were included in the analysis grouped according to their respective demographic region, age, gender, and marital status. Reponses were collated in a spreadsheet and such data were analyzed with Statistical Package for the Social Sciences version 20 (IBM, Armonk, NY, United States of America). Of 740 HCV-positive patients, 500 (67.5%) were male and 240 (32.4%) were female. Taking into consideration the marital status of participants 690 (93%), HCV patients were married posing their partners to the risk and 50 (6.8%) were unmarried. The study population was divided into 4 different age groups – the first group consisted of children and adolescents with age less than and equal to 25 years. The second group included young adults with age ranging from 26 to 35 years. The third group included productive age ranging from 36 to 45 years and the fourth group consisted of population prone to more health conditions with age >45 years. Large number of patients were above 45 years of age (47.2%), followed by age group of 26–35 years (23.6%), in the age group 36–-45 years (20.2%) and least were of age <25 years (8.7%). 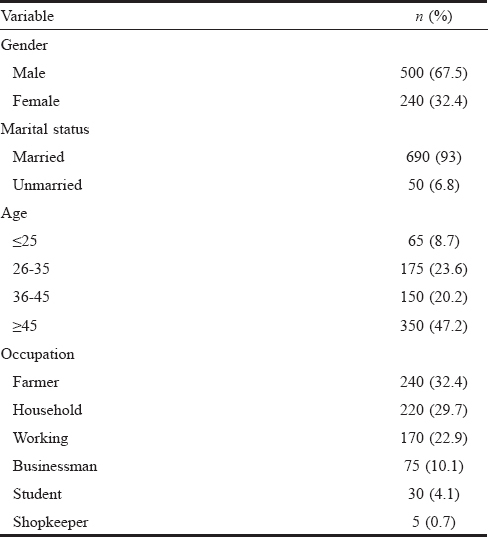 Occupation wise 32.4% participants were farmers, 29.7% were household, 22.9% were working population, 10.1% businessman, 4.1% students, and 0.7% were shopkeepers [Table 1]. Approximately 17.6% of patients had donated blood in the past. 8.1% patients had a history of blood transfusion. 34.4% of the study participants had their nose/ear piercing. Tattooing was got done by 4.1% of the participants and 43.2% had undergone surgical intervention in the past. When asked about the history of drug abuse 39.8% participants were intravenous drug abusers [Table 2] [Figure 1]. Six hundred and thirty-five (85.8%) participants had received dental treatment in the past, of which 270 (36.5%) were treated by quacks, 190 (25.6%) had received treatment from family dentist, and 175 (23.6%) received treatment from referral dentist, that is, from hospital-based dentists [Table 3] [Figure 2]. About 165 (22.3%) of the participants received treatment from BDS doctors, 60 (8.1%) had been treated by MDS doctors in the past [Table 4] [Figure 3]. Four hundred and twenty (56.8%) participants were found asymptomatic and unaware about the disease before the diagnosis as observed in the present study and were diagnosed to have hepatitis C infection during a routine checkup. Three hundred and twenty (43.2%) participants presented with medical problems such as pain in the stomach, nausea, indigestion, pallor of skin and eyes. Commonly detected genotype of HCV was genotype 3 (52.7%), followed by genotype 1 (35.1%), 10.8% had infection with genotype 4, and 0.68% presented with no information about genotype. 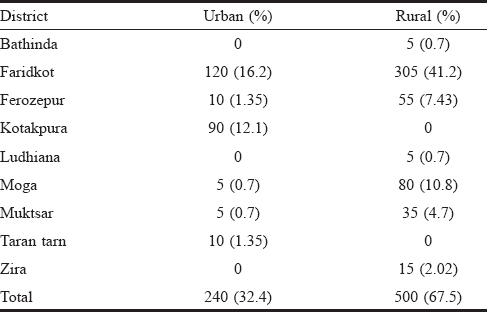 Predominant rural distribution was found with 67.5% (n = 500) rural respondents and urban participants were 32.4% (n = 240) [Table 5] [Figure 4]. HCV infection is a foremost cause of liver cirrhosis, hepatic failure, and hepatocellular carcinoma resulting in a steady and noteworthy reduction in the quality of life. In this retrospective research, demographic, geographical, and clinical data of HCV-positive patients who visited civil hospital, Faridkot, for free medication was studied. This gave an overview of prevalence and cause of Hepatitis C infection and its distribution in Malwa region of Punjab. Our findings predict that HCV is prevalent in Malwa region of Punjab with etiological factors that are controllable and measures need to be implemented for the same. From findings of our study, it was found that a large percentage of patients, that is, 79.1% started treatment immediately after knowing about the disease, but 21% patients started after an interal of time (1–6 months) indicating a lack of knowledge about the consequences of the disease. Male patients (67.5%) were found to be HCV positive in greater percentage than female (32.4%) patients. This may be assumed to be due to more exposure to recurrent visits to barber shop for shave sharing the same razor. This may be assumed that in India, males look for health-care services earlier than females. Other reasons may be neglected health-care needs of females. Higher incidences in males can also be attributed to societal freedom leading to drug addiction, tattoo, and sexual behavior. Earlier studies have also reported higher percentage among males being HCV positive as compared to females. Predominant rural distribution (67.5%) of patients with HCV infection is mainly attributed to insufficient health-care facilities in rural areas; patients from rural area visit more to civil hospital due to close proximity. Other reasons include unhygienic conditions, uneven socioeconomic conditions and insufficient medical facilities for basic health-care needs in villages, repeated use of unsterilized instruments and syringes by quacks, drug abuse, and lack of awareness about the prevention and the management of this infection among rural people and many of the professionals as well. In spite of awareness regarding the route of spread of HCV infection, a considerable percentage of family physicians in Punjab state still continue to reuse needles and syringes. The severity of hepatitis C, its progression, and response to therapy are similar irrespective of etiology of the infection. Among the risk factors, tattooing has been found one factor involved in the transmission of HCV. HCV and prevalence of HCV infection were found higher among individuals who had nonprofessionally made as opposed to professionally-made tattoo's in a cross-sectional study carried in Taiwan. In a cross-sectional study carried out in Brazil, an association between tattoo and HCV infection was found. Medical and surgical interventions may act as risk factors for HCV infection and dental procedures being one of them. The study questionnaire included the investigation of history of dental treatment such as tooth extraction, gum surgery, or root canal therapy. The potential risk of HCV transmission through dental treatment was evaluated in our questionnaire-based study to rule out the association between HCV infection and dental extraction. Dental procedures resulting in bleeding and exposure to infected body fluids increase the risk of disease transmission. Barrier techniques should be used for preventing the common routes of transmission such as patient to dentist, dentist to patient, and patient to patient in dental settings. Proper infection control measures should also be implemented such as autoclaving and use of disposables. In the present study, 85.7% study population had a history of dental treatment; this information remains unbiased as everyone can remember dental treatment taken in the past. A single exposure to tooth extraction could render the participant prone to acquire HCV infection, irrespective of number and frequency of tooth extractions performed in the past. Our study results found dental treatment as a risk factor for the spread of HCV similar to one study  and association of dental treatment and Hepatitis C indicates lack of implementation of infection control measures by dental care providers (e.g., poor sterilization procedures and unsafe injections, use of contaminated needles). Findings of the current study correlate with the earlier studies.,, In one study, a significant association was found between dental extraction and increased anti-HCV seropositivity. In our study, 36.5% patients were treated by quacks which indicates knowledge gap among quacks and illiterate patients masking their decision making to opt for safe treatment. People consult practicing dental quakes instead of public sector hospitals due to poor economic condition. Quacks may unlikely to be aware of and may not be following adequate sterilization procedures. Thus, contaminated equipment become a predominant root cause of HCV transmission in rural population. As the distribution of diseases is not uniform among population of Punjab, it is important to rule out the bottlenecks in the medical and dental practices of various regions which are participating in spread of disease in the community. In our study population, genotype 3 was predominantly found, similar to other studies from Northern and Central India., In contrast to findings of a study carried in Southern India found where genotype 1 to be predominant  type, however, genotype 1 was reported at the second position in the present study. In our study, 8.1% patients had received blood transfusion similar to the findings of another study carried in North India. Transfusions are necessary and extensively used in surgery and medicine for many years. Mandatory screening of blood and blood products for HCV in India was introduced for the first time in 2002 which explain the reason for higher proportion of participants having hepatitis C among blood donors in our study (17.1%). Blood donation by the voluntary donors should also be monitored with the objective to control the spread of HCV infection, and there exists no such strong monitoring or expert donor counseling at many of the blood banks. Most of the used serologic screening methods used for screening by blood banks are not sensitive enough for early detection of HCV. Blood banks have been reported to use rapid methods in urgencies. To save on the cost, PCR-based test is performed at countable few institutions only. Approximately 39.8% of participants were found to be intravenous drug abusers similar to the findings of another study. Rural people have misconception that injections have more curative influence. This added by unscientific approach of quacks that prefer to administer more injection become a potential risk for spread of HCV infection. It was alarming to note that 85.5% of the study participants have received dental treatment in the past. This may not essentially mean that all such patients had HCV infection during dental procedure as they may have undergo other procedures also. Khan et al. in 2007 found prevalence rate of 39.7% and indicating the need for safe injection practices, especially in villages. In another study, detection of anti-HCV antibodies and HCV RNA in patients with no history of HCV infection before dental surgery indicated that instruments for dental procedures are improperly sterilized. While the search for an effective and affordable therapy and vaccine continues, preventive strategies remain the foremost task for public health authorities. There is no such documented data available; however, the prevalence of hepatitis C in the Malwa region of Punjab is very high. Following this study, technician and doctors at dental colleges, dental clinics, small and large hospitals were visited and interacted informally, and their feedback was taken on sterilization practices being followed by them. Most of the small centers were probably only boiling the instruments and did not have autoclaves. Large hospital had autoclaved, but still boiled instruments were frequently used. Only countable few could define to ensure adequacy of autoclaving. Risks of spread of HCV infection in these HCV seropositive patients are not higher than those without HCV seropositive controls as HCV has also been detected in participants lacking clear defined risk factor and these cases constitute about 40%–45% of HCV infections. Potential preventable risk factors promoting the spread of HCV infection as identified by the study include drug abuse, tattoo, unsafe sterilization practices, and screening of blood. Community awareness programs generating demand for adequately sterilized instruments from barbers, tattoo makers, local quacks, and even modern medicine doctors and dentists should be implemented. Guidance programs for quacks on sterilization procedure and sensitization of barbers and tattoo makers to use disposables should be incorporated. Continued medical and dental education of professionals reinforcing good injection practices, use of disposable syringes, barrier techniques, and proper sterilization of instruments should be provided. Proper disposal of used syringes, needles and other items following Biomedical Waste Management guidelines, and use of effective sterilization procedures should be done. Use of more specific and sensitive method of screening in blood banks for adequate screening of the blood and blood products and mandatory nucleic acid testing screening should also be implemented in India like other countries for assurance of blood safety for the prevention of further transmission of HCV infection. For emergency procedures, use of automated immunoassays must be made mandatory. While many of the blood banks may be routinely using immunosorbent assay, but it has been commonly absorbed that the technicians handling the tests are inadequately trained and most of the blood banks are using manual testing which is likely to have high human error. It is further recommended that blood banks must use fully automated blood testing and accreditation of blood banks be mandatory. The entire above are likely to raise the cost, but this can save long-term morbidity and mortality where treatment is costlier than preventive costs. It was surprising that most the modern medicine doctors and dentist had expressed that boiling was sufficient and that could not define how to use autoclave adequately. The doctors are likely to open small clinics and nursing homes and mostly employ untrained technicians for sterilization. Now the question that arises is how will they ensure adequate sterilization and prevent cross infection? With 80% of the patients having the past dental treatment in the current study, it could mean that more patients get infected during dental treatment than other modes. Inadequate knowledge levels among treating personnel (quacks and modern medical professionals including dentists) at all phases could be single largest risk factor for the spread of HCV infection. On interview with faculty of medical and dental college, it was informed to authors that while autoclaving is theoretically taught, ensuring adequate sterilization was not taught and the colleges themselves did not have standard operating procedure to ensure adequate sterilization. As the data were collected from patients visiting civil hospital, Faridkot, for free medication, findings could not be generalized to population where higher income group patients might be getting treatment from different health-care providers and other research institutes. The authors acknowledge participation and feedback of participating patients, staff, and doctors at various clinics, medical colleges, and dental colleges. Sadeghi F, Salehi-Vaziri M, Almasi-Hashiani A, Gholami-Fesharaki M, Pakzad R, Alavian SM, et al. Prevalence of hepatitis C virus genotypes among patients in countries of The Eastern Mediterranean Regional Office of WHO (EMRO): A systematic review and meta-analysis. Hepat Mon 2016;16:e35558. Rehan HS, Manak S, Yadav M, Deepinder, Chopra D, Wardhan N, et al. Diversity of genotype and mode of spread of hepatitis C virus in Northern India. Saudi J Gastroenterol 2011;17:241-4. Soin D, Grover P, Malhotra R. Hepatitis C virus infection in dialysis patients: A retrospective study from a tertiary care hospital. Int J Res Dev Pharm L Sci 2015;4:1529-32. Xia GL, Liu CB, Cao HL, Bi SL, Zhan MY, Su CA, et al. Prevalence of hepatitis B and C virus infections in the general Chinese population: Results from a nationwide cross-sectional seroepidemiologic study of hepatitis A, B, C, D, and E virus infections in China, 1992. Int Hepatol Commun 1996;5:62-73. Khattak MF, Salamat N, Bhatti FA, Qureshi TZ. Seroprevalence of hepatitis B, C and HIV in blood donors in Northern Pakistan. J Pak Med Assoc 2002;52:398-402. Frank C, Mohamed MK, Strickland GT, Lavanchy D, Arthur RR, Magder LS, et al. The role of parenteral antischistosomal therapy in the spread of hepatitis C virus in Egypt. Lancet 2000;355:887-91. Chowdhury A, Santra A, Chaudhuri S, Dhali GK, Chaudhuri S, Maity SG, et al. Hepatitis C virus infection in the general population: A community-based study in West Bengal, India. Hepatology 2003;37:802-9. Garg R, Kaur S, Aseri R, Aggarwal S, Singh JP, Mann S, et al. Hepatitis B and C among farmers – A seroprevalence study. J Clin Diagn Res 2014;8:MC07-9. Riaz H, Latif MZ, Mujtaba SW, Nizami R, Qureshi MA. Hepatitis B and C; an immuno-chromatographic study of hepatitis B and C prevalence in Southern Punjab. Prof Med J 2017;24:244-8. Yen T, Keeffe EB, Ahmed A. The epidemiology of hepatitis C virus infection. J Clin Gastroenterol 2003;36:47-53. Strader DB, Wright T, Thomas DL, Seeff LB; American Association for the Study of Liver Diseases. Diagnosis, management, and treatment of hepatitis C. Hepatology 2004;39:1147-71. Standard Operating Procedures. Mukh Mantri Punjab Hepatitis C Relief Fund. 1st ed. Punjab: Mmphcrf Department of Health and Family Welfare; June, 2016. Available from: http://www.pbhealth.gov.in/mmphcrf.pdf. [Last accessed on 2017 Oct 21]. Nishioka Sde A, Gyorkos TW, Joseph L, Collet JP, Maclean JD. Tattooing and risk for transfusion-transmitted diseases: The role of the type, number and design of the tattoos, and the conditions in which they were performed. Epidemiol Infect 2002;128:63-71. Nishioka SA. Tattoos as Indicators of Transfusion Transmitted Diseases in Brazil: A Matched Hospital Based Cross-Sectional Study. [Doctoral thesis]. Montreal: McGill University; 2000. p. 166. Mahboobi N, Porter SR, Karayiannis P, Alavian SM. Dental treatment as a risk factor for hepatitis B and C viral infection. A review of the recent literature. J Gastrointestin Liver Dis 2013;22:79-86. Al Humayed SM. The risk of acquiring hepatitis B and C viral infections following tooth extraction in Al Farsha area, South-Western Saudi Arabia. Saudi J Dent Res 2016;7:127-31. Yildirim B, Tahan V, Ozaras R, Aytekin H, Mert A, Tabak F, et al. Hepatitis C virus risk factors in the Turkish community. Dig Dis Sci 2005;50:2352-5. Karaca C, Cakaloğlu Y, Demir K, Ozdil S, Kaymakoğlu S, Badur S, et al. Risk factors for the transmission of hepatitis C virus infection in the Turkish population. Dig Dis Sci 2006;51:365-9. Al-Kubaisy W, Al-Naggar RA, Shamsidah Ni N, Bobryshev YV, Al-Kubaisy MW. Is dental extraction a risk factor for contracting HCV infection: Abs, RNA and genotype detection. Oral Biol Dent 2014;2:7. Mele A, Sagliocca L, Manzillo G, Converti F, Amoroso P, Stazi MA, et al. Risk factors for acute non-A, non-B hepatitis and their relationship to antibodies for hepatitis C virus: A case-control study. Am J Public Health 1994;84:1640-3. Ali I, Siddique L, Rehman LU, Khan NU, Iqbal A, Munir I, et al. 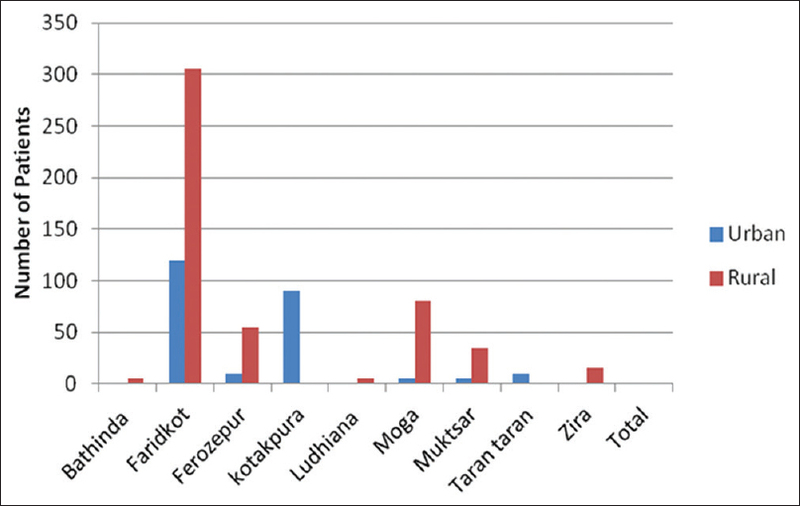 Prevalence of HCV among the high risk groups in Khyber Pakhtunkhwa. Virol J 2011;8:296. Panigrahi AK, Roca J, Acharya SK, Jameel S, Panda SK. Genotype determination of hepatitis C virus from Northern India: Identification of a new subtype. J Med Virol 1996;48:191-8. Hissar SS, Goyal A, Kumar M, Pandey C, Suneetha PV, Sood A, et al. Hepatitis C virus genotype 3 predominates in North and Central India and is associated with significant histopathologic liver disease. J Med Virol 2006;78:452-8. Valliammai T, Thyagarajan SP, Zuckerman AJ, Harrison TJ. Diversity of genotypes of hepatitis C virus in Southern India. J Gen Virol 1995;76(Pt 3):711-6. Nishioka Sde A, Gyorkos TW, MacLean JD. Tattoos and transfusion-transmitted disease risk: Implications for the screening of blood donors in Brazil. Braz J Infect Dis 2002;6:172-80. Dipta TF, Rahman MT. Safe blood transfusion: Past, present and future. Bangladesh J Pathol 2009;24:1-2. Khan H, Hayat Z, Rehman RU, Zarif M. Comparative analysis of risk factors and complications of hepatitis B and C infections at Khyber teaching hospital Peshawar. Hepat Mon 2007;2:83-6. Hajiani E, Masjedizadeh R, Hashemi J, Azmi M, Rajabi T. Hepatitis C virus transmission and its risk factors within families of patients infected with hepatitis C virus in southern Iran: Khuzestan. World Journal of Gastroenterology: WJG 2006;12:7025-28.